I reached an important milestone this weekend with my Adeptus Mechanicus army. Painting a 500 point army to completion. Sorry for the glare....and the curtains. I guess thirteen models doesn't seem much to write home about (especially as I completed the bulk of these models this year during Squaduary and Monster March.) But it's very significant for me. Having a fully painted army of a certain value is quite a rare event in my hobby life, so it's definitely one worth documenting. 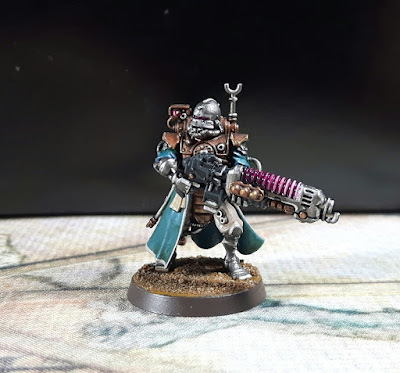 Some of you may recall that when I took part in Squaduary I had painted the rather inadvisable combination of an arc rifle and a plasma caliver for my squad of Skitarii Vanguard. As it turned out, the lack of a second identical weapon really damages the focus of a squad on the tabletop, so I felt I needed a second plasma caliver before I could honestly call the army complete. I painted up the guy above and added him to the vanguard squad for a double dose of hot plasma death! I'm also taking part in a campaign over the next few months run by my buddy Lewis over at Canis Aureus. The concept is to increase the army size by 250 points per month and play a series of games over a system map of the Charadon Sector. Hopefully this will push me on to complete 750 points by the end of October, which ties in nicely with Dreadtober as I will be painting an Onager Dunecrawler to add to the force. Stay tuned for more updates on Dreadtober and, with any luck, a fully painted 750 point force in a month's time! Awesome work! Really nice idea to have a campaign to push you to add more painted models to the army. Thanks Michael! It's nice to have the double whammy of the campaign and Dreadtober to really give me a shove. I remember those beautiful Kastelans made during Monster March, the event was a funny thing to do! Your army is looking great, I really like the glossy violet-pink, and with that blueish green you have made a cool painting scheme. Thanks a lot. I love the community painting events, every time I participate I feel like I achieve loads more than I would alone. How did you do that lovely blue/green? The blue/green colour is pretty simple. Start with a black undercoat and paint over a couple of coats of Citadel Alaitoc Blue. Then wash with Citadel Biel-Tan Green. That's all there is to it! You can do a second coat of Biel-Tan Green if the first one isn't deep enough for your liking.